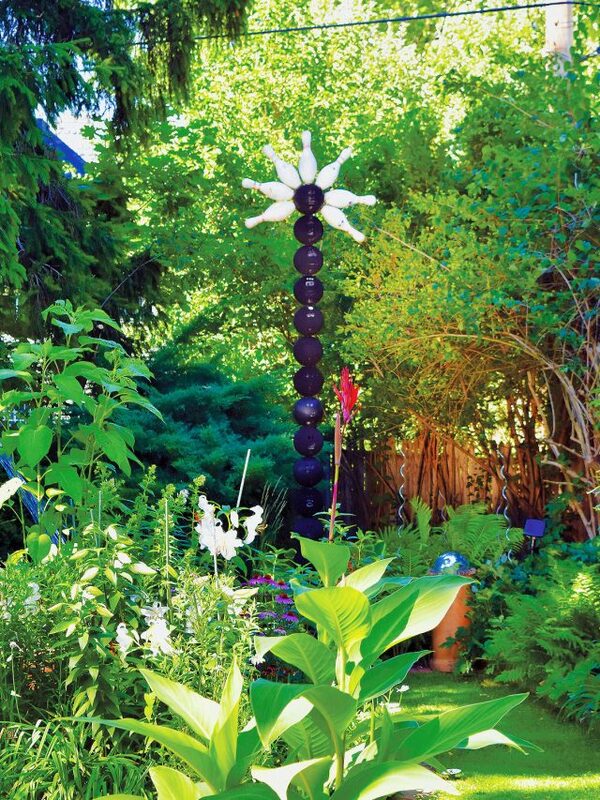 These best gardens display creativity, ingenuity, and originality in spades, and they are featured in Buffalo-Style Gardens by Sally Cunningham and Jim Charlier. The book is crammed full of inspirational pictures and stories of how these gardens were developed by their owners. It’s comforting to know that many of them didn’t know what they were doing at first, and often stumbled onto the design that transformed their property. 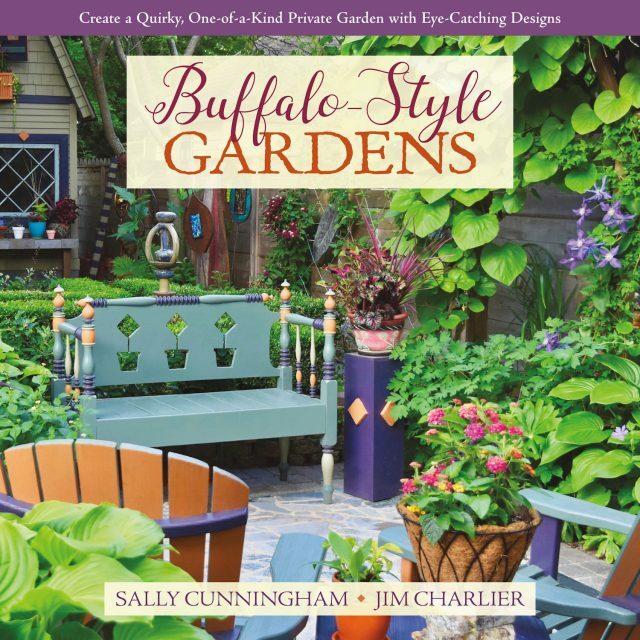 You can learn from their mistakes, and their solutions to design challenges, because a good portion of the book explains design principles and shows you how Buffalo gardeners use those principles in vastly different ways. I think the opportunity to visit so many other local gardens spurs them on to do more and better in their own gardens. My biggest takeaway: “people–especially non-gardeners–see and remember the things in your garden more than most of the plants.” These “things” can be anything from a beautifully crafted gazebo to a quirky tower of bowling balls. 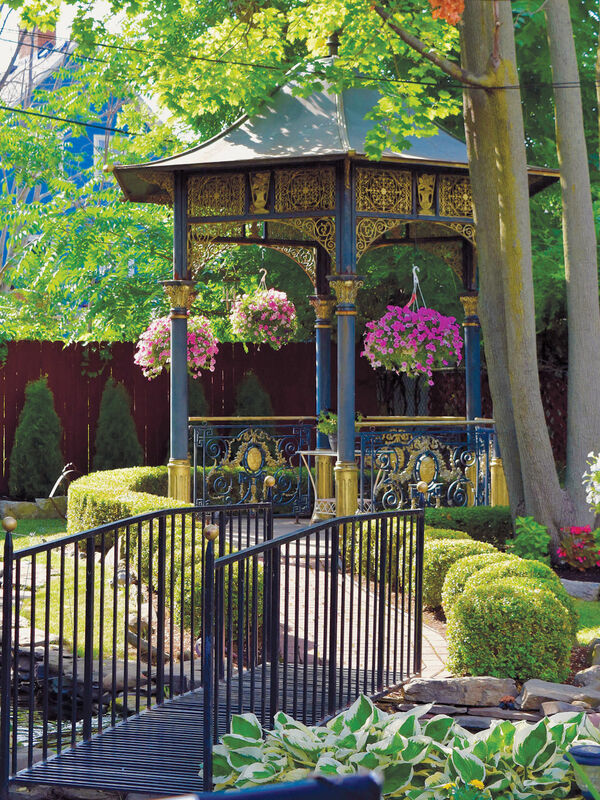 This gorgeous gazebo is on the upscale end of the Buffalo garden style spectrum. What the authors neglect to point out is that if you aren’t already a bit of a hoarder, it may take some time to find just the right art–or junk–that expresses your personality and makes a garden truly your own. The final chapter addresses the question of bringing this same gardening excitement to other cities, to your town. Cunningham and Charlier briefly outline how Buffalo did it, and suggest how another locale might do it differently. They also discuss the many benefits gardening has for the individual and the community. If you are a community activist (or aspire to be one), this information alone might be worth the price of the book. P.S. I’m in the two photographs on page 200, both times as generic people illustrating a point, so if you don’t already know me, you wouldn’t be able to pick me out of the crowd. Yes, I am a frugal, thrifty, penny-pinching, cheap gardener, but I do know that 1) sometimes quality is worth paying for and 2) my time is worth something, too. I’m happy to say Kerry Ann Mendez, author of The Budget-Wise Gardener, knows this, too. Her book is crammed full of tips and strategies to get the most plant from your hard-earned dollars. I already knew that perennials are often sold three or four to a pot to make them look fuller, and can easily be divided into separate plants when you get home. I did not realize, however, that sometimes the small perennials often used in containers are sold in the annual section of a garden center at a much lower price. It pays to look over the whole display before you make your selections. Sometimes where you plant can cost you money, and Mendez has tips on avoiding costly mistakes by planting the wrong plant too close to utilities, in the path of snow removal, and other situations that you might not consider. My favorite chapter covers shopping strategies–what to look for when buying online, and unusual places close-to-home to find good plants. For example, I once purchased an excellent hellebore from the grocery store at Easter, for 25% less than I would have paid at a big box store. It was intended to be a decorative indoor plant for the holiday, but I just had to harden it off and it was ready to plant outside. I also appreciate her pointing out that different species or cultivars of the same plant can vary widely in their value, either because of their behavior or their size. She has an honest discussion of the many varieties of coneflowers and heucheras that have failed to thrive, and lists reliable selections of each. Also, she points out that one large-growing specimen, such as ‘Alexander’s Giant’ brunnera can fill the space required by multiple ‘Jack Frost’ brunneras, and both plants may be sold for the same price in the same size pot. If you’ve been gardening for many years, you will surely know some of these tips already–but you will learn a thing or two! Mendez doesn’t waste your time advising you grow seeds in egg cartons or regrow lettuce from its stump, tasks that are feasible but may cost you more in time than they save in cash. Her advice is practical and well-informed, and even if her tips didn’t save you a penny, they might just save your sanity. Thank you for your wonderful posts! and also happy by know there is a book about the Buffalo gardens…. Great reviews, Kathy. That Mendez book is new to me but it’s on my to buy list now. Sections on echinaceas & heucheras alone make the book particularly attractive. I’ve picked up amazing bargains at grocery stores, too. Mini roses and unusual varieties of chrysanthemums have done just fine in my garden for years. Some of those ‘enjoy and toss’ marketed plants I’ve found on sale at end of holidays – like Valentine’s Day coming up – in pristine shape & for less than $2. I’ve also found hardy (for my zone) fern varieties sold as house plants that I couldn’t find at local nurseries & listed in plant catalogues for considerably more than the grocery price tag. Fun! Great reviews! I met Jim at the 2nd Fling in Chicago in 2009. I grew up in Buffalo long before this garden event started, long before I was interested in gardening. Now I look at their warmer zone and think about all I was missing in those days! I bought the Budget-wise gardener last year and have yet to crack it open. My bad. I’m rethinking my garden layout and size due to overwhelming pressure from the deer population. I can’t keep spending money on new plants only to have them devoured or destroyed by the wildlife. Thanks for letting me know there is a book about the Buffalo gardens. I treasure my trip to Buffalo in 2010, and Jim’s knowledge and good humor. Thanks for letting us know about the book. Hi Kathy, I have ordered the Buffalo Gardens book. I am really looking forward to reading it. It is probably the only way I will see these gardens, although I am still hopeful I will see them one day. The other book sounds interesting. Try to stay warm the next few days.